Congregation Shomrei Torah has been trying to build a synagogue on the 40,000 square foot property they own in Clifton for over a decade. Which the congregation then did. In 2018, Weil, Gotshal & Manges (of suing Mahwah for banning eruvs fame) sent a letter to Clifton on behalf of the congregation asking for attorneys fees from the previous lawsuits pursuant to RLUIPA, which they said had been violated as the city had imposed arbitrary limitations on Shomrei Torah’s building and had treated them differently than other building applications brought before the municipality. The letter cited comments made about the wider Orthodox community in public hearings and variances for other houses of worship that had been approved without controversy. A $2.5 million payment towards their previous attorney fees. The bulk of this money will be paid by the city’s insurance carrier, minus an $150 thousand deductible. Sidewalks and a crosswalk on the streets surrounding the synagogue, to be installed and paid for by the city. Below is the settlement between Mahwah and the NJ Office of the Attorney General. This closes the lawsuit brought last year by previous Attorney General Christopher Porrino over what he saw as a civil rights violation and attempt to ban Orthodox Jews from the township’s public parks. Notify the AG before introducing any new laws affecting access to township parks. Notify the AG before introducing any new laws affecting posting on utility poles. Keep records of complaints related to existing ordinances governing township park use and present a quarterly report on their enforcement to the AG. Allow lechis to be installed on utility poles in the township and investigate any damage to them as a criminal offense. Make a suspended payment of $350k to the AG for legal fees and penalties. The payment will be cancelled after four years if no evidence of further discrimination is found, at which point notifications and quarterly reports will no longer be required. As the Bergen Record posted yesterday: Mahwah mayor files 12-page challenge to recall petitions. We have obtained the letter and posted it in full below. This is a developing story and as more information is received, we will post it. Recall Petitions must be signed by all people collecting signatures and this was allegedly not done here. If a statement is made in support of the recall, the subject gets to include a statement in response. Since no statement was included, no response was permitted either. However, the Mayor has provided a document (attached as Exhibit A) that allegedly accompanied the recall petitions. The Mayor alleges that political opponents “are driving the Recall Petition efforts behind the scenes in an attempt to defy the will of the voters of Mahwah who twice elected Mayor Laforet”. That petitions were misrepresented as “polls” or that signatures were needed to get his name on the ballot, in addition to other improprieties. Why hasn’t the NJAG case concluded against Mahwah? On October 26, 2017 the NJ Attorney General filed a Civil Rights suit against the Township of Mahwah and the Township Council members. The suit alleged discriminatory animus infused in ordinances related to a parks ban (since repealed) and a proposed ordinance which would have implicated an eruv (the Township has since promised never to enact such a ban in the future). The case was transferred to Federal Court in November and is still pending. Why? The eruv action has settled. Why hasn’t this action? On December 4th, Robert Moss sought to intervene in the action to protect Green Acres funding on behalf of the public. Today, the AG and other plaintiffs opposed the intervention. What are the “true issues in controversy”? Stay tuned… perhaps this case isn’t wrapping up after all. [SHOCKING VIDEO] Mahwah Resident unleashes accusations of corruption by Township attorneys at Council meeting. 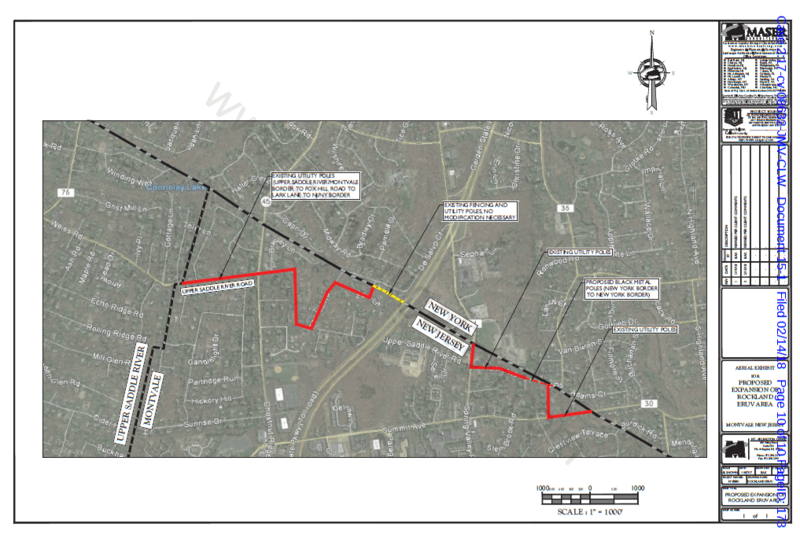 Last night, the Mahwah Township Council allowed several questions regarding the settlement agreement signed between the Township and the Bergen Rockland Eruv Association to end the ongoing Civil Rights litigation. The episode was reminiscent of Mahwah councilman (now resigned) Steven Sbarra claiming that a Holocaust survivor addressing the council was a paid actor and imploring those in attendance to “follow the money, folks“. At the end of Ms. LoPiccolo’s comments, Council President Robert Hermansen connects the dots from (((Tracy Zur))) to the (((Simon Wiesenthal Center))) to (((Michael Cohen))) and then to Mahwah Mayor (((Bill Laforet))). Tracy has always been an active member of her community by serving as a Board Member of both the Jewish Federation of Northern New Jersey as a Women’s Philanthropy and Executive Board Member, as well as being an active member of the PTA. In addition, Tracy sits of the Board of Trustees at the Gerrard Berman Day School, and has volunteered for Alternatives to Domestic Violence and Meals on Wheels. She also serves as an NLC and Simon Wisenthal Center mentor and serves on the Board of both Emerge NJ and Women for Progress. The Simon Wiesenthal Center is a global human rights organization researching the Holocaust and hate in a historic and contemporary context. The Center confronts anti-Semitism, hate and terrorism, promotes human rights and dignity, stands with Israel, defends the safety of Jews worldwide, and teaches the lessons of the Holocaust for future generations. Is it any stretch of the imagination that an organization whose mission is combating hate in a contemporary context, sent a representative to speak at a Town, whose council has been described as “entertain[ing] – and act[ing] under the influence of – public comments rife with hate and bias”, by the State of New Jersey? The action against Mahwah and the Town Council has not yet been resolved. I wonder what the reason could possibly be? Perhaps Hermansen isn’t the only person that can connect some dots. The AG Lawsuit against Mahwah and its council can be found here. I reached out to the firm of Cleary Giacobbe Alfieri Jacobs, LLC, Mr. Olear and Council President Hermansen. Mr. Hermansen responded via text “please go away”. I have not yet heard back from the law firm or Mr. Olear, but will update the post if they wish to comment. The weather is getting warmer and with the welcome change in seasons comes the pitter-patter of kids feet in municipal parks. Normally, this is my favorite time of year. Nature is basically beckoning the kids to come outside and play. But what happens in Mahwah, when they do just that? It was barely a year ago when the subject of Hasidic children in parks became such a contentious issue that the Township of Mahwah literally tried to ban them from coming. 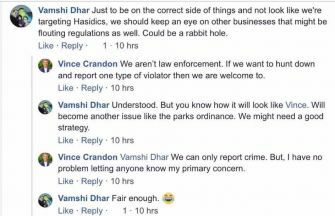 At the time, Chief Batelli noted that there were 35 calls about Hasidic people in the park the day before the ban was set to take effect. 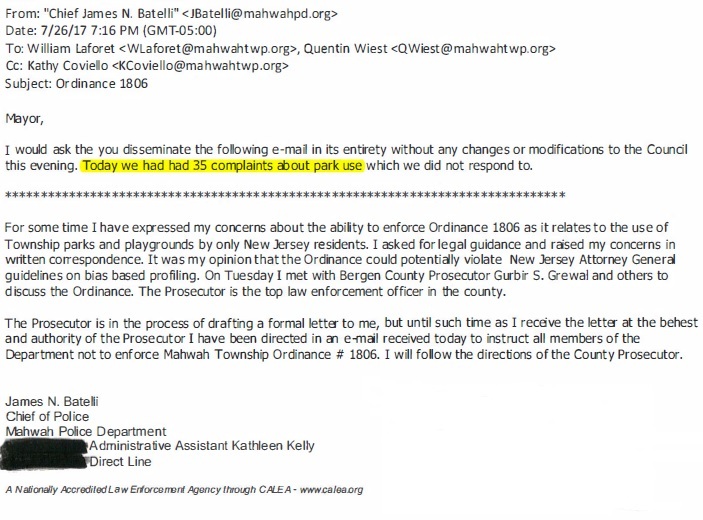 Due to the highly problematic nature of the ordinance, it caught the attention of the County Prosecutor (and current Attorney General) Gurbir Grewal as well as the State of NJ, which still has a pending lawsuit against the Township of Mahwah and its Town Council. 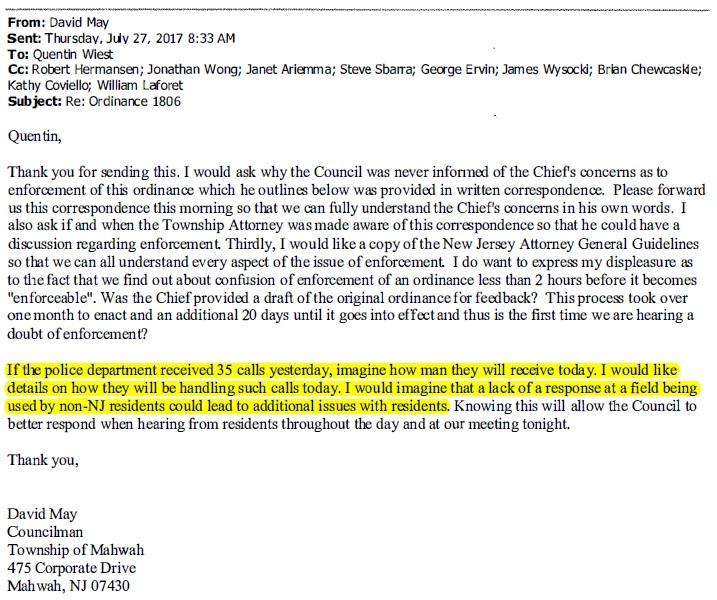 Following the calls to the police department, councilman David May, who was re-elected this past November noted that “a lack of a response at a field being used by non-NJ residents could lead to additional issues with residents”. Despite advice from the Mahwah Township attorney, Brian Chewcaskie that the Council should not pass any legislation during the pending litigation, the Council brought forward and passed Ordinance 1816, which amended section 9-1.4 of the code establishing 38 prohibitions in parks. Legally, you can’t just pick and choose what to enforce or whom to enforce it against. What will happen if a toddler digs up a rock (violation of #3) or his sister climbs a tree (violation of #6)? These are normal things that normal people do in parks. They generally harm no one. Will there be a zero-tolerance policy on all of them? Perhaps only certain ones? Time will tell if section 9-1.4 will be applied neutrally. The weather is starting to warm up and kids will be in Winters Park again soon. While the vast majority of Mahwah’s residents are wonderful neighbors, experience has shown that there are several that will call the police on (((certain))) kids if they see a violation, even one as silly as leaning a bike against a tree or playing unauthorized ball. We saw this when a resident created a “neighborhood watch group” and brazenly explained that he was targeting Hasidic stores. But the police are subject to the Law Against Discrimination (“LAD”) and the Constitutional protections of citizens. If residents will be calling the police to report on these “illegal actions” taking place in the park by Hasidic children, what will be the response? Will the police issue summonses? Will they do so to every kid that “abets ball playing” or just those for whom they are called over? Does the council realize the Attorney General hasn’t dismissed the Federal Civil Rights action currently pending against them? Mahwah officials should act now, before this becomes an issue. UPDATE: After claiming the Town Hall meeting will be postponed and that they claim a meeting with the AG will happen in the next two weeks, a stipulation was filed extending the time to respond to the complaint through March 6th. While I wouldn’t want to make any predictions, it seems that a settlement with the AG would have been an easy thing to accomplish if that’s the direction the State wanted to take. Perhaps the State, having seen how people are treated at open public meetings in Mahwah, wants to vindicate the rights of the public? Perhaps something else will be added to the complaint? What will happen between now and March 6th? We don’t exactly know. But we will be keeping an eye on the court docket. This past Tuesday, the Mahwah Council abruptly cancelled a scheduled Town Council meeting to discuss the settlement agreement entered into with the Bergen Rockland Eruv Association by the Town. Last night, the Mahwah council met at their regular scheduled meeting. They indicated the reason for the cancellation and it doesn’t make any sense. At the 16:50 mark of the video below, the Council President Robert Hermansen asked the Township’s attorney Brian Chewcaskie to make a statement about the Town Hall meeting. This begs the question: didn’t that situation exist before the Town Hall meeting was schedule? Since the ink was drying on the settlement agreement, Hermansen has been speaking about how they will be meeting to possibly move and relocate the eruv. Now, he wants to claim that the Town Hall meeting needs to be postponed because they will be having that meeting? Facts, how do they work? So, why did the Town Hall meeting need to be cancelled? I’m very confused. 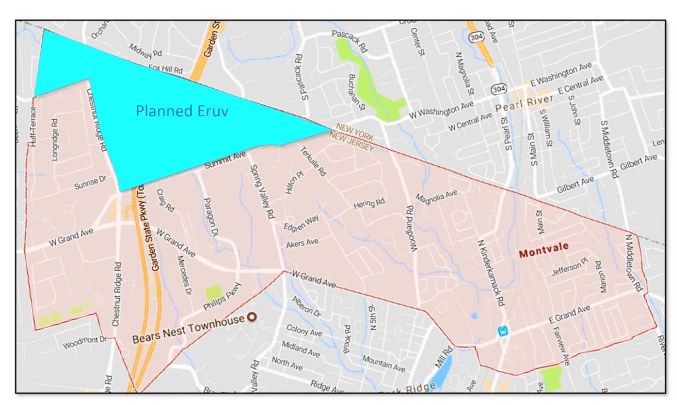 What does the agreement say about moving the eruv out of Mahwah? Does the agreement permit such a dialogue? 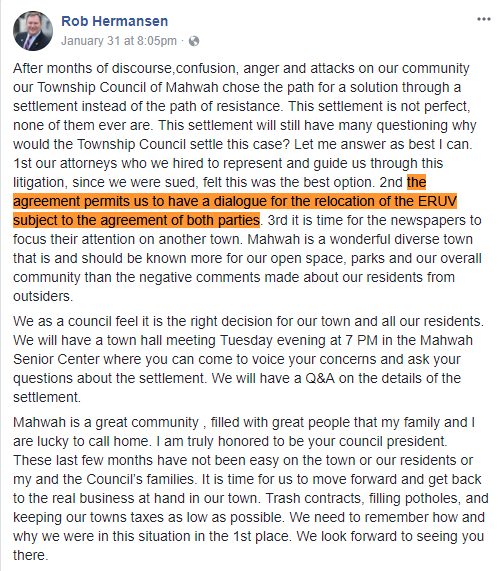 The agreement permits Mahwah to put Hermansen in stocks and let the community light his pants on fire, subject to the agreement of both parties. It’s an excellent post, it goes through the relevant facts and cites to the settlement agreement. It’s worth your time to read. Hermansen: “Thank you. Therefore, I’m not going to get into the nuts and bolts of everything, of it, but I can just tell you that the township council is still trying to work with the parties, with everybody, to find something that is a best interest for both parties on both sides, so that we can do the right thing for the community, for everyone, to hopefully move on so that we can get back to the business of what’s the most important things in this town and start to function on things and start to worry about our taxes and the sewer issues that we have and the things that are going on on Chapel Road and things that are happening in other areas of this town that we need to focus on as opposed to things that have been consuming this town for a very long time. Having been called out, the council that scheduled a Town Hall meeting to discuss the dialogue, claims the continuing dialogue prevents them from having a Town Hall meeting. The language they use changes to describe the settlement and those calling them out are branded as liars. And that, is how the chronic liar of Mahwah deceives the people.